The title of the post makes it sound like I’m about to write an important philosophical treatise; however, I’m really going to talk about the magazine. The magazine was published in Milwaukee, so when I was a kid in the 1970s, the world was awash in Ideals. As a matter of fact, I got a free copy for some reason when I was in elementary school. I want to say that it had a sailboat on it, but the 1952 Adventure Issue might be stuck in my brain because I bought it in my eBay sales days and have used the image for software testing in the last couple of years. I was kind of excited about the free copy of the magazine I got because I didn’t have many books in those housing project days, and anything free, especially a book, was a gift. But when little boy me tried to read it, I found it to be a collection of photos and poems. So although I carried that magazine forward a while, I’m pretty sure I never read it completely. So, as I mentioned, I grew up in a world where you’d see the magazine in schools, in homes, and in shops. But somewhere that world ended. As late as the early 21st century, I saw them from time to time in book sales and garage sales, but even that diminished. As a matter of fact, I didn’t even see this issue at a garage sale. I saw a box of vintage home magazines that I bought for my beautiful wife because she likes going through them for old recipes and whatnot. When she came to the Autumn 1962 Ideals in the stack, she gave it to me because I have a penchant for reading chapbooks of poetry and whatnot. So I read it. 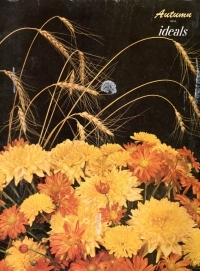 This issue focuses on Autumn, harvest, and Thanksgiving themes, although some of the poems seem to remember harvest and Thanksgiving as coming together, but in most of the country the date was fixed to the end of November by the late 1870s (I looked it up). So maybe some of the memories in the poems were smeared, or perhaps they were variant dates. Most of the memories of school starting were from one-room schoolhouse days. This wasn’t a conscious throwback–in Missouri, at least, the rural areas did not consolidate their schools into sprawling school districts until the late 1940s, so the writers of these poems would remember those days instead of the warehouses of children those of us from cities and reorganized districts would remember. At any rate, I read the book in the evenings, on my glider overlooking the sunset and the rolling hills of Greene County, Missouri. I’m getting old enough that it’s easy to push my nostalgia buttons, even for a time where I didn’t live. So I enjoyed the publication more than the poems within it. You know, the poems in it aren’t such that they’ll be studied in 400 years, but poems written 400 years ago aren’t studied today (the cranky old English major spat). These poems were written by amateur poets, graduates (sometimes) of those one room schoolhouses (but probably not high school) who went on to have families and then spend some idle time writing poetry. That rhymed. Using words that many adults of the (then) Future wouldn’t even know. This is what our great grandparents and grandparents often did instead of playing games on their smartphones. Creative hobbies versus consumptive hobbies. It seemed like in the past people did a lot more creative things with their free time. Music. Woodworking. Working on cars. Writing little poems. Now, it’s television and video games. Maybe I’m just thinking along these lines because I’ve spent too much time recently (and when you say “recently” at my age, sonny, that can mean the last decade) just reading books and playing Civilization IV (because the new-fangled Civilizations are Not As Good as the old ones). But I don’t think it’s just me. The borrowed nostalgia and the nostalgia for my youth where Ideals was available gave me the brief urge to start collecting the magazine or at least to pick it up when I see it in Ozark or Clever, but I’m fighting the urge, believe it or not. I have a lot of things already to read. But time, and the availability of the magazine, will ultimately guide how many of these find their way into the shelves at Nogglestead. It will probably be more than none, although it might take me a while to read them. As I was reading the Autumn 1962 issue here, I was pleased to see some incarnation of the periodical is still in print. Sometimes I like to see the threads of memory from my youth carried forward into my middle age.